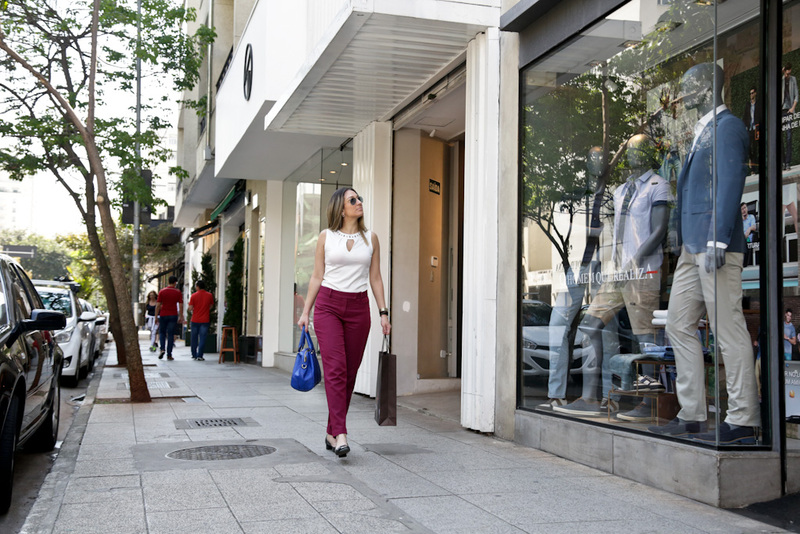 The city of São Paulo is a paradise for all kinds of buyers – from those who need something in specific, to others that simply love shopping and the thousands who daily buy to resell at the capital paulista. From international brands Oscar Freire to street markets at Rua 25 de Março, the capital offers a wide commercial possibility comparable to global metropolis. São Paulo has over 70 shopping malls spread throughout the city which are temples of shopping and entertainment. It is a daylong program or even for several days, once the majority of them have great food squares, cinemas, theaters, gyms, kids attractions and expositions. There are malls even in subway stations, like Santa Cruz and Tatuapé, which provide easy access and are part of the daily route of locals. Besides this, it was in São Paulo that the first mall, Iguatemi, was inaugurated, at the neighborhood of Itaim, in 1966, with luxury stores. For those who prefer street stores, to find what you need is quick and easy for paulistanos and visitors at the specialized market streets, which focus on specific products that range from leather articles or rare discs to antiques. At the three major popular markets: Brás, Bom Retiro and Rua 25 de Março, the largest outdoor shopping center in Latin America, it is also possible to find everything at accessible prices. On Itaim, specially on Rua João Cachoeira, and in Moema, on Rua Bem-Te-Vi, there are high standard outlet stores. Among the most sophisticated, there is the most famous and luxurious Oscar Freire, at Jardins, with brands like Ellus, Mont Blanc, Melissa, Carmin and many others. Another great differential at São Paulo are the handcraft and antiques fairs, which offer from the most wanted articles to the most unusual. From arts to handcraft, the most famous of the capital paulista are Praça da República and Praça da Liberdade. The most popular of them, however, is the one at Benedito Calixto, which has antiques and other quite interesting curiosities. Another option is Feira de Antiguidades do MASP, at Avenida Paulista. The world of decoration and design doesn’t miss a beat. There are exclusive shopping centers and furniture factories, from the most vintage to the most modern. Many are at Rua Teodoro Sampaio, in Pinheiros. In parallel, Cardeal Arcoverde, where there are vintage furniture stores. And on Marginal Tietê and Marginal Pinheiros, there are mega construction stores. The major feature at downtown is the popular market. Rua 25 de Março attracts people from all over Brazil that seek feedstock, handcraft and even carnival costumes. 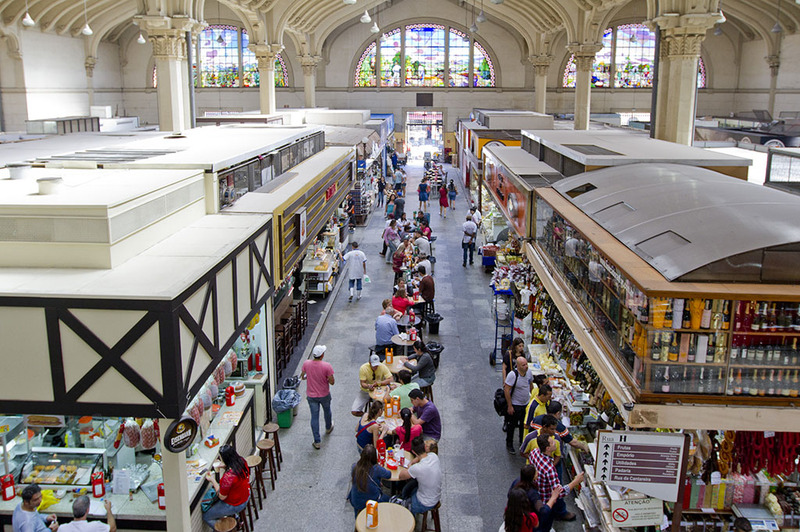 Mercado Municipal, right next to it, is a mandatory stop to buy spices, food and beverage. On the surroundings of Rua José Paulino, at Bom Retiro, and on Brás there is a clothing market. Rua São Caetano, traditionally known as Bride’s Street, is entirely dedicated to dresses and wedding accessories. For those who seek electronics and car accessories, there is Rua Santa Ifigênia. 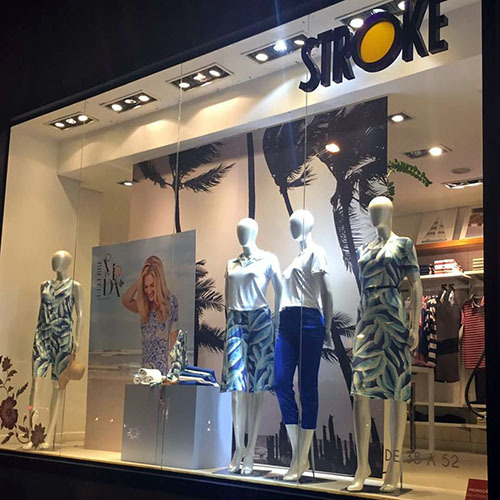 At Oscar Freire, Alameda Lorena and Rua Bela Cintra, there are international and national best brands stores. On Rua Augusta, the market is more diversified. Around number 2690 there is Galeria Ouro Fino, which has interesting and fun stores, thrift shops and alternative brands. The shopping malls are also around there. Paulista Mall is next to subway station Paraíso and Frei Caneca a few blocks away from subway station Consolação. Pátio Higienópolis is well known for its fancy stores. MASP’s weekend fairs and the ones at Shopping Center 3, on Avenida Paulista, also provide good shopping options. On Vila Madalena there are clothing stylists and plastic artists’ ateliers. Interesting and fun stores are also featured on the region. On Praça Benedito Calixto there are decoration objects. On Saturdays, the square has a handcraft fair. On the West side of the city there are several shopping malls: West Plaza, Iguatemi, Eldorado, Butantã. Now, plants and fresh fruit and vegetable markets are always available at Ceagesp. On Pinheiros, there are furniture stores. On Rua Teodoro Sampaio there are couches, beds, chairs and new decoration objects. In parallel, there is Rua Cardeal Arcoverde, where vintage furniture and objects set the tone at the showcases. 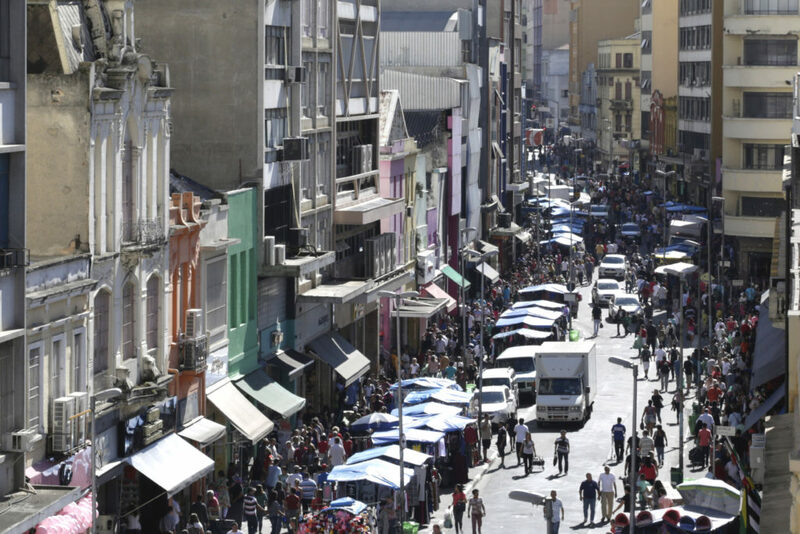 On Lapa there is a more popular market, with clothing and footwear stores. At the local market, there are lots of typical Nordeste articles, fruits and vegetables. Near Congonhas Airport there is the neighborhood of Moema, where there are outlet stores of clothing and shoes that you cannot miss and one of the biggest malls in town, Ibirapuera. Other paradises on the South side are shopping malls Morumbi and Market Place, known for its excellent cinema exhibition rooms. Now shopping mall D&D, on Marginal Pinheiros, is entirely dedicated to decoration. 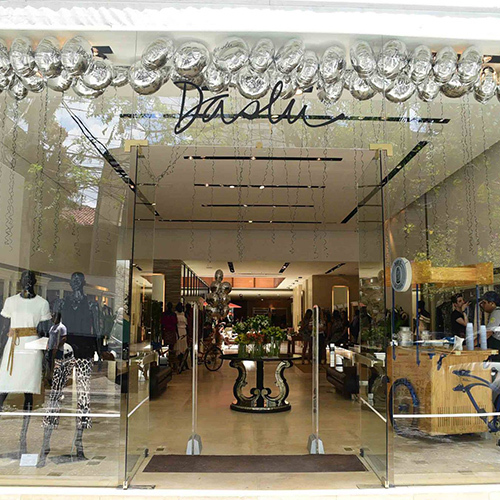 For even more sophisticated acquisitions, there is Daslu, a fancy department store of international and national brands and Shopping Mall Cidade Jardim. Located in a privileged region, beside Marginal Tietê, shopping mall Center Norte presents the largest sale volume per squared meter in all business in town. Next to it, there is Lar Center, the right place to buy furniture and decoration. Shopping malls D, Santana Parque and Metrô Tucuruvi are also part of the shopping tour. For those who look for large footwear store, it is good to reserve some hours of the day to visit Jorge Alex, which offers a wide range of options. Brands’ clothing can also be found at Rua Pedro Doll and throughout Rua Voluntários da Pátria there is popular market. There are plenty of gastronomic and shopping fairs in São Paulo! You can find it all, for all tastes and budgets, available for locals and visitors on the most diverse neighborhoods in the city. The antique or handcraft fairs are the right place to find paintings, rare objects, clothing, trinkets and decorative parts, generally exclusive. Besides this, they are great options for calm and unusual rides, to go alone, with friends or family. Spread out in several regions, practically every day there is one. And, the best of all, outdoors! Besides the traditional antique or handcraft fairs, the capital paulista has a new trend, already all over paulistanos: the gastronomic fairs. On the food trucks bandwagon, some business people of the area have decided to gather in specific points of the city, in pre-defined days, to offer their delicacies, from fast foods to natural and organic food, friendly prices and a loose atmosphere. Modern and alternative, these are ideal places to feed off the hunger you get after a shopping spree and empting your wallet! Below, there are some of the most famous and agitated fairs in São Paulo. Choose yours, enjoy your shopping and have a good meal! 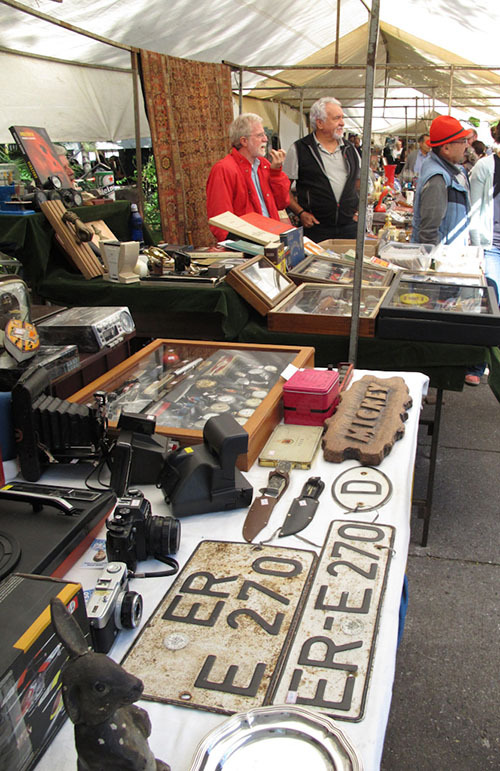 The antiques fair from MASP’s (Museu de Arte de São Paulo) open area, at Avenida Paulista, is very traditional. It gathers collectors and people in search of rarities, paintings, sculptures, lamps, chandeliers, old coins and home objects. Where is it? Avenida Paulista, 1.578, at the museum’s open area (Subway station Trianon-MASP). Working Hours: Sundays, from 9am to 5pm. Feira Masp. Foto: Caio Pimenta/SPTuris. After touring the region you can drop your bike and walk to the front of Parque Trianon where, on Sundays, there is an Arts and Handcrafts fair. And you can also find gastronomic stands there. You can take a break and have a bite! Where is it? Avenida Paulista, 1700, in front of Parque Siqueira Campos/Trianon (subway Trianon-MASP). At República, the main attractions are paintings and drawings. Many local artists make their works at the site. There are also ornaments and dolls crafted manually, clothing, trinkets and other articles. Another great attraction is food. Barbecue, sweets and Chilean empanadas are the most popular. Where is it? Praça da República (next to subway station República). Working Hours: Saturdays and Sundays, from 9am to 5pm. The most popular of the fairs, however, is the one at Praça Benedito Calixto, in Pinheiros. With a diversified public – among them artists and designers – it has around 300 stands that sell decoration articles and antiques, besides items like LP records, silverware and vintage furniture. Where is it? Praça Benedito Calixto, 112 (Pinheiros – nearby subway stations: Clínicas and Sumaré). Working Hours: Saturdays, from 8am to 7pm. Now the Liberdade fair, which takes place at the neighborhood of the same name, is rich in culinary and Japanese handcraft. It has been taking place for around 30 years and has over 200 stands that offer from trinkets, to Japanese lamps, bonsais, fish tanks and things in general, mostly oriental. The yakissoba and tempura stands are also very popular. Where is it? Praça da Liberdade, s/n (subway station Liberdade). Working Hours: Saturdays and Sundays, from 9am to 6pm. The largest feature of this fair is the quality of the products exposed in the yellow stands: decoration objects, leather articles, trinkets, mosaics, lamps, dog clothing, wooden handcraft, embroidery, canvas paintings and frames, soaps, stones, crochets, marquetry, besides traditional food stands, like yakissoba, tempura, pastel and bolinho de bacalhau. Where is it? Praça Santa Rita de Cássia, s/nº, Rua das Rosas with Av. Senador Casemiro da Rocha. Working Hours: Saturdays, from 9am to 4pm. The fair has handcraft stands, trinkets, wooden articles, plastic arts, sweets and snacks. Where is it? Praça Nossa Senhora Aparecida (Av. Ibirapuera). Mercado Pop is a multicultural permanent and itinerant area with alternative characteristics linked to the presentation of new talents and new trends at the areas of fashion, art, design and music. Famous for gathering stylists, handcrafters and artists at the same place, it now opens its doors to gastronomy under the same ideal of providing grounds for new talents to rise at the city’s scenery. That is why, on every Saturday, from 11am to 7pm, Mercado Pop has in its underground chefs of the most diverse trends to show their authorial work at accessible prices. Where is it? Rua Teodoro Sampaio, 1041 – Pinheiros. Working Hours: Mondays to Fridays, from 10:30am to 7pm and Saturdays, from 10am to 7:30pm. Expositors sell objects made of nets, silk bedspreads, mugs, rag dolls, wooden toys, clothing, etc. It has stands of oriental food, pastries, Italian food, natural sandwiches and sweets. The fair gathers art and gastronomy and is on Rua dos Patriotas in front of one of the entrances of Museu do Ipiranga and Parque da Independência. It’s a good ooportunity to eat and buy rag dolls, personalized t-shirts, flip-flops, trinkets and much more! Where is it? Rua dos Patriotas, between Rua Bom Pastor and Av. Nazaré. Working Hours: Sundays, from 10am to 5:30pm. Kept by the Bolivian community of São Paulo, it gathers traditional food; handcraft, music and the traditions of these immigrants at praça do Pari. They sell salteñas (traditional pastry filled with meat), buñuelo (fried dough) and salsipapas (sausage, onions, potato and banana da terra, all fried) and more exotic dishes like anticucho (ox’s heart on the stick) and api (purple corn juice, served hot). Where is it? Praça Kantuta (close to number 625 At Rua Pedro Vicente — near subway station Armênia). Working Hours: Sundays, from 11am to 7pm. There are small art works, leather purses, accessories and stone trinkets, dresses, rugs, dishcloth, knick-knacks, patchworks, besides crafted products, with stands of traditional culinary. Where is it? Praça Alfredo Egydio de Souza Aranha – Subway station Conceição. Working Hours: Tuesdays, Thursdays and Fridays, from 8am to 4pm. The fair has 45 expositors selling trinkets, ceramic utensils, fabric purses and embroidery towels. There is food from Bahia and yakissoba. Where is it? Praça Gentil Falcão – Brooklin. Working Hours: Every Tuesdays, from 9am to 4pm. Sells jewelry, burned paintings, ceramics and other handcraft products. Where is it? Praça Enéias Martins Nogueira (near Avenida Luis Carlos Berrini). Working Hours: Wednesdays, from 10h to 16h. Located on the corner of Rua Flórida with Nova Independência, it offers products like purses, silverware, dolls, rugs, Brazililan stones and paintings, etc. Where is it? Rua Florida X Rua Nova Independência. Working Hours: Thursdays, from 10am to 4pm. At the open area of the Museu Brasileiro de Escultura, at Jardins neighborhood, there is the MUBE Antiques and Design Fair. The 80 expositors work with articles such as vintage lamps, gallès (handcrafted wristbands, necklaces and earrings), porcelain, paintings and sculptures, oriental rugs, watches and utensil pieces of the 50s, besides other vintage curiosities. Onde fica: Rua Alemanha, 221 (At the Museum’s open area). Working Hours: Sundays, from 10am to 6pm. The fair is located at Praça João Duran Alonso, on the corner of Avenida Luis Carlos Berrini with Rua Quintana. Overall, 45 expositors commercialize trinkets, ceramic utensils, fabric purses, embroidery towels. The culinary has traditional Bahia dishes and yakissoba. Where is it? Avenida Luis Carlos Berrini X Rua Quintana. Working Hours: Fridays, from 10am to 4pm. 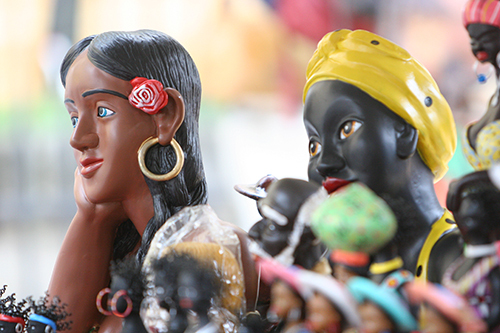 More culture and art can be found at this fair on Praça Cornélia, at Lapa neighborhood. Since 2004, around 90 expositors are popular for the high standards of the products exposed, which include handcraft, plastic arts, antiques, clothing and ornamental plants. It is also possible to find stones and numismatic (old money bills and coins) and philately (stamps). On some Saturdays there are also theatrical, music and dance performances. Where is it? Praça Cornélia (Rua Clélia, near number 900), in front of church São João Maria Vianey. Working Hours: Saturdays, from 9am to 5pm. Those who go to the fair can buy exclusive handcraft pieces, like sculptures, decoration objects, and gifts, among others. All made by local handcrafters. Besides this, the fair has stands with traditional food from different region of the country. And there is more! The fair has quality chorinho music presentations, free of charge, on Sundays starting at 3pm. Where is it? Largo da Matriz – Freguesia do Ó. 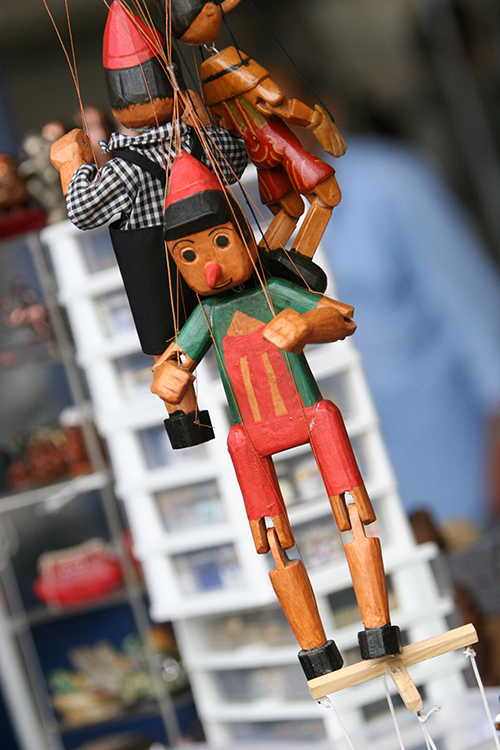 The Fair of Praça dos Omaguás II is one of the eight fairs of arts and handcraft in the area of Pinheiros neighborhood. Held every Sunday from 10am to 5pm, at Avenida Pedroso de Morais, 800, the fair attracts thousands of people to the exhibition and trading of handcraft and art works produced by 70 artists who expose on site. Where is it? Av. Pedroso de Morais, near number 900 – Pinheiros. Working Hours: Sundays from 10am to 5pm. You will find at Praça Dr. João Batista Vasquez, which is near Praça Memória do Jaçanã, an Arts and Traditional Food fair from Jaçanã. At the place, there are around 20 handcrafters that sell fabrics, purses, bags, embroidery, crochet, knitted clothing, trinkets, flowers, chocolates, homemade sweets and even tapioca. Where is it? Praça Dr. João Batista Vasquez. Working Hours: Saturdays, from 10h to 17 h.
At Largo São José do Belém the specialty is old money and coins’ market, besides diverse handcraft and regional food from Brazil and other countries. Where is it? Largo São José do Belém. Working Hours: Wednesdays, from 9am to 5pm. Where is it? Praça Ouvidor Pacheco e Silva, s/nº – Centro. Working Hours: Thursdays, Fridays e Saturdays, from 8am to 5pm. Working Hours: Tuesdays, from 9am to 5pm. Working Hours: Thursdays, from 9am to 5pm. Where is it? Espaço do Matão – Rua Santa Prisca X Rua Profª Ida Kolb – Casa Verde. Working Hours: Saturdays, from 7am to 2pm. Carried on by three retired men that try to sell their handcraft. Where is it? Near number 3000 of Avenida Engenheiro Caetano Álvares – Limão. Working Hours: Saturdays, from 9am to 5pm e Sundays, from 9am to 3pm. Where is it? Praça José Moreno, Tatuapé. Where is it? Praça Ciro Pontes, Mooca. Where is it? Praça Visconde de Souza Santos, Mooca. Working Hours: Fridays, from 9am to 5pm. The city that has around 80 shopping malls and dozens of market streets specialized in several products also has many outlet or clearance stores where the main idea is: to save some money. The discounts of the famous American network start at 20% and reach up to 80% in articles from previous collections. Address: Avenida Imperatriz Leopoldina, 1349 – Vila Leopoldina – West Side – São Paulo. Working Hours: Mondays to Fridays, from 9am to 7pm; Saturdays, from 9am to 6pm; and Sundays, from 10am to 4pm. Phone: (+55 11) 3834 5655. Prices that you can’t miss and if you find any faulty, you pay even cheaper. Jeans pants from previous collections start at R$ 59. Address: Av. Imperatriz Leopoldina, 1361 – Vila Leopoldina – West Side – São Paulo. Working Hours: Mondays to Saturdays from 9am to 6pm and at Sundays e holidays from 10am to 3pm. Phone: (+55 11) 3641 8369. The notorious handmade shoes brand has models with special discounts. Address: Alameda Lorena, 1616 – Jardim Paulista – West Side – São Paulo. Working Hours: Mondays to Fridays, from 9:30am to 8pm, Saturdays, from 10am to 7pm. Discounts up until 50% in exclusive articles and, for payments in cash, there is 5% off. Working Hours: Mondays to Fridays, from 9:30am to 5pm; Saturdays, from 9:30am to 5pm. Phone: (+55 11) 2021 7266. Here you can get up to 70% off. Children articles are also available for purchase. Address: Rua Gaivota, 1.210 – Moema – South Side – São Paulo. Working Hours: Mondays to Saturdays, from 10am to 8pm; Sundays, from 11am to 5pm. Phone: (+55 11) 5096 3156. For those who like beach wear, this is the place. Sizes range from P (small) to GG (Extra Large) and discounts can reach 40%. Address: Rua Sarandi, 98 – Jardim Paulista – West Side – São Paulo. Working Hours: Mondays to Fridays, from 10am to 7pm. Phone: (+55 11) 3798 2044. Known for glamorous underwear pieces from brands like Valisere and Darling. Prices start at R$ 29. Address: Rua Gaivota, 1.262 – Moema – South Side – São Paulo. Working Hours: Mondays to Saturdays, from 10am to 8pm; Sundays and holidays, from 10am to 4pm. Phone: (+55 11) 5533 8737. Party dresses from famous brands for just R$ 500, as well as sandals and shoes with affordable prices. Address: Rua Barra do Tibagi, 441 – Bom Retiro – Downtown – São Paulo. Working Hours: Mondays to Fridays, from 9am to 8pm; Saturdays, from 9am to 4pm. Phone (+55 11) 2495 3132. The decoration of the place is warming with sewing machines spread out in the store. Special discounts are up to 70%. Address: Rua Teçaindá, 9 – Pinheiros – West Side – São Paulo. Working Hours: Mondays to Fridays, from 8am to 6pm. Phone: (+55 11) 3071 2455. Beach wear with fun articles starting at R$ 100. Address: Rua Barra do Tibagi, 1.097 – Bom Retiro – Downtown – São Paulo. Working Hours: Mondays to Fridays, from 8am to 5:30pm. Phone: (+55 11) 3333 3331. Everything for sports and gym at affordable prices. Address: Rua do Rocio, 352, Vila Olímpia – South Side – São Paulo. Working Hours: Mondays to Fridays, from 9:30am to 5:30pm; Saturdays, from 10am to 3pm. Phone: (+55 11) 3045 4045. Trinkets, belts, purses and hair accessories; all at popular prices. Address: Rua João Cachoeira, 1.385 – Itaim Bibi – South Side – São Paulo. Working Hours: Mondays to Saturdays, from 10am to 8pm. Phone: (+55 11) 3842 0145. Working out outfit and sports gear and outfits with discounts up to 80%. Address: Rua Cristiano Viana, 80, casa 4 – Jardim Paulista – West Side – São Paulo. Working Hours: Mondays to Fridays, from 10am to 9am; Saturdays, from 10am to 6pm. Phone: (+55 11) 3093 1677. Items from Cori, Emme, GAP and Luigi Bertolli, are sold for attractive prices just as shoes from Arezzo and Cris Barros clothing. Address: Rua Raul Saddi, 18 – Butantã – West Side – São Paulo. Working Hours: Mondays to Saturdays, from 10am to 9pm; Sundays and holidays, from 10am to 8pm. Phone: (+55 11) 3038 0226. Up to 90% off in articles sold at NK Store. Address: Rua Cristiano Viana, 78/80 – Jardim Paulista – West Side – São Paulo. Working Hours: Mondays to Fridays, from 10am to 7pm; Saturdays, from 10am to 6pm. Phone: (+55 11) 3064 2991. Items from Restoque with discounts starting at 50%. Examples: dress Bo.Bô, from R$ 998,00 for R$ 399,20, and shorts John John at R$ 99,00. There are also Le Lis Blanc articles. Address: Rua Casa do Ator, 867 – Vila Olímpia – South Side – São Paulo. Working Hours: Mondays to Saturdays, from 10am to 8pm; Sundays and holidays, from 12pm to 6pm. Phone: (+55 11) 3044 3124. Products of the brand from previous collections with up to 80% off. Address: Rua Silva Airosa, 40 – Vila Leopoldina – West Side – São Paulo. Working Hours: Mondays to Saturdays, from 10am to 7:45pm; Sundays and holidays, from 1pm to 6:50pm. Phone: (+55 11) 3644 3252. Several products with unique prices: clothing with 50% off, footwear with 40% off and toys 30% off. Address: Av. Imperatriz Leopoldina, 1.434 – Vila Leopoldina – West Side Oeste – São Paulo. Working Hours: Mondays to Saturdays, from 9:30am to 6pm. Phone: (+55 11) 3813 0045. Articles for children from 0 to 10 years old with discounts up to 50%. Address: Rua Homem de Mello – 856 – Perdizes – West Side – São Paulo. Working Hours: Mondays to Fridays, from 9:30am to 6pm; Saturdays, from 9:30am to 3:30pm. Phone: (+55 11) 3675 8762. Articles from previous collections 50% off. Address: Rua Oscar Freire, 958 – Jardim Paulista – West Side – São Paulo. Shoes from Ralph Lauren, John Galliano, Nike, Adidas and many others. Currently, there are several stores in the city but the outlet operates on the website. Sells clothing for children, like from Zara. Address: Rua Jamanar, 300 – Morumbi – South Side – São Paulo. Working Hours: Mondays to Fridays, from 9:30am to 7pm; Saturdays, from 9:30am to 6pm; Sundays, from 12pm to 6pm. Phone; (+55 11) 3501 6513. Articles from Marisol, Puket, Mini & Kids, Tip Top, Banana Baby and many others. Address: Praça Oito de Setembro, 94 – Penha – East Side – São Paulo. Working Hours: Mondays to Saturdays, from 9am to 8pm. Phone: (+55 11) 4328 8508. Address: Rua Tuiuti, 2.139 – Tatuapé – East Side – São Paulo. Oscar Freire unit works as a clearance store, selling previous collection’s articles up to 30%% off. Address: Rua Oscar Freire, 205 – Jardim Paulista – West Side – São Paulo. Phone: (+55 11) 3081 0552. 30% and 70% off in couches, armchairs and much more. There is a 7% discount for payments up front. Address: Rua Henrique Schaumann, 462 – Pinheiros – West Side – São Paulo. Working Hours: Mondays a Fridays. From 10am to 7pm; Saturdays and Sundays, from 10am to 14h. Phone: (+55 11) 3897 8484. Cushions of fun themes and elastic fabric, all at a price that fits the wallet. All items are from previous collections, but it is worth it a look. Address: Rua Maurício de Barros, 54 – Bom Retiro – Downtown – São Paulo. Working Hours: Mondays to Fridays, from 10am to 5pm. Phone: (+55 11) 3337 0099. Furniture and decoration objects in 3 floors of the store. All items for half of the original price. Address: Rua Dr. Fonseca Brasil, 221 – Morumbi – South Side – São Paulo. Working Hours: Mondays to Fridays, from 9:30am to 7pm; Saturdays, from 10am to 6pm. Phone: (+55 11) 3746 7044. Between 20% to 80% off in bed and bathing articles. There are also sets for cradles and children’s pajamas. Address: Rua João Cachoeira, 1.184 – Itaim Bibi – South Side – São Paulo. Working Hours: Mondays to Fridays, from 10 to 7pm; Saturdays, from 10am to 4pm. Phone: (+55 11) 3849 4638. The city of São Paulo offers everything to enjoy a royal day: shopping at the most renowned brands, exclusive dish tasting and even staying at high standard hotels. The luxury sector usually generates R$ 4 billion in the capital, which gathers a large set of options for those who can and want to pay for comfort and sophistication. It is possible to buy a Ferrari, a piece of jewelry at Bvlgari, taste a rare imported wine or a contemporary D.O.M. dish. Other than, of course, enjoying a stay at hotel-boutiques, like Unique, Fasano, Emiliano and L’Hotel, and high standards, such as Hilton and Grant Hyatt. Among its streets, avenues and shopping malls are some of the most wanted brands from all over the world. The city was the first in South America to host the jewelry store Tiffany & Co; it has the eighth most luxurious street of the world, Oscar Freire; there is Daslu, a temple of glamour in brand shopping; at Jardins, there are stores with the most wanted imported cars and motorcycles of the world; and there are shopping malls like Iguatemi and Cidade Jardim, for a VIP public. São Paulo has also the second helicopter fleet of the world, with over 500 helicopters (only behind New York City), it has over 10 golf clubs and a prestigious Jockey Club, with over 135 years of history. For those who wish to make an indoor ride and have access to what’s the most luxurious, there are essential points. 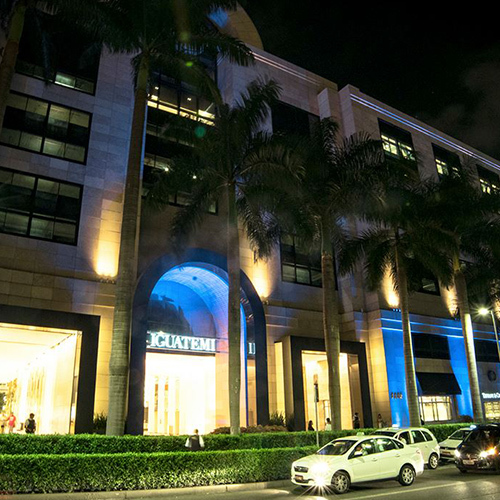 Shopping Mall Cidade Jardim was the first in Brazil to host the French Hermés and Longchamp. There is also Spa Cidade Jardim, which provides the most modern beauty treatments, from Finish saunas to pilates class. Another primordial place to enjoy a shopping day is shopping mall Iguatemi, the first created in Brazil. 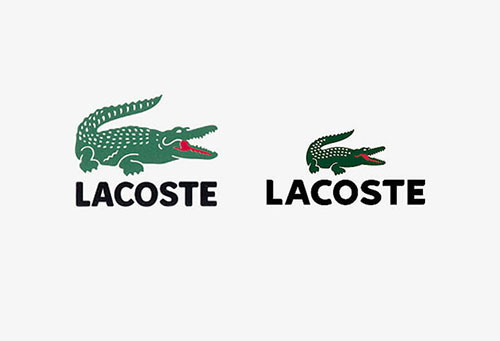 It has several brands, like Hugo Boss and Dolce & Gabanna. Besides shopping, the tourist can choose between charming and exclusive cafes. Now at shopping mall JK Iguatemi, a new luxury area of the city, there are unique stores as TopShop and Miu Miu, already renowned worldwide. Daslu is a mega luxury store that can’t be left out of the list. The store has products from the great fashion names and its own line. Rua Oscar Freire. Foto: Jose Cordeiro/ SPTuris. When talking about the richness in the streets of São Paulo, it is necessary to mention Rua Oscar Freire. It has an extense sidewalk and it has 200 of the most beautiful showcases in town, from stores like Calvin Klein Underwear and Carmim. It also has unique stores, like Galeria Melissa and Espaço Havaianas, which have exclusive sandals with Brazilian trademark. Avenida Europa and its surroundings host car dealer stores like Ferraris, Porsches, Lotus and BMWs. The cars have over 6 digits prices and are an object of desire of thousands of people. The avenue has a sequence of showcases with classic brands like Bentley and Harley Davidson, and super powers like Lamborghini. 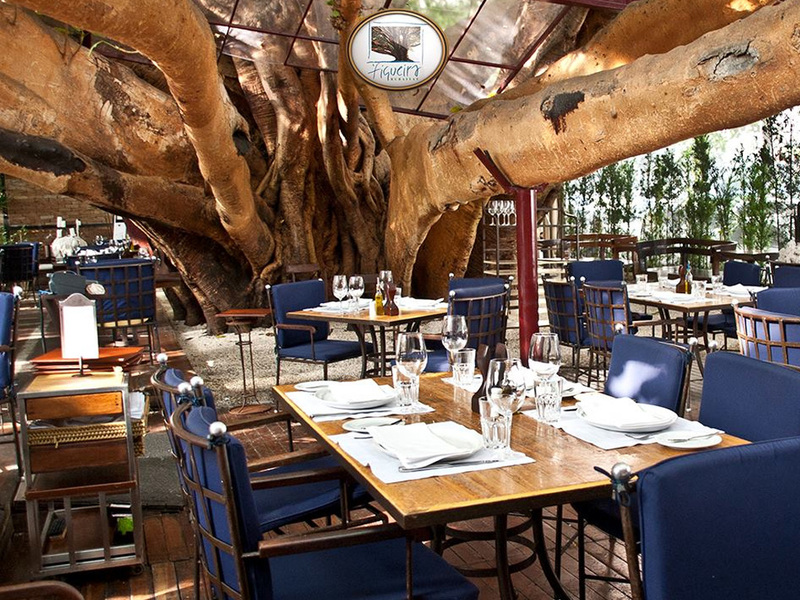 In São Paulo you can eat well in exclusive restaurants like Figueira Rubaiyat, which has in its area a gigantic tree that names the place and creates a very cozy atmosphere. The place provides incredible dishes with lots of quality meat cuts and imported wines. An option to enjoy dinner with a date is Fasano, which has a very intimate atmosphere, once there are tables with small lamps. Its kitchen mixes contemporary with classic seasoning, in traditional dishes of Italian gastronomy. Terraço Itália, which exists for over 40 years, is a postal card of the city and one of the most traditional restaurants downtown. As the name itself mentions, the dishes go back to Italian food. The restaurant is at the 41st floor of the building and it provides a view of the entire capital paulista. It is also interesting to join a dancing dinner, to relive the beginning of the 20th century. You cannot miss some of the places that sell exclusive products. One example is Casa Santa Luzia, which has a super fresh fruits and vegetables sector and a wide range of kosher products. Empório Santa Maria is a store that has wines, fine cheese, high standard cuts in meats and a bazar, which offers clay pans, flower sets, spices and much more. That goes without mentioning the Vinoteca, in which one can taste over 40 different kinds of wine, and the Sushi Bar, located at the second floor, that has a full menu. Galeria dos Pães is an option for those who want to taste fine cheese, buy Lindt chocolates, experiment wines in its cellar and eat sandwiches in ciabatta buns. Working Hours: Mondays to Saturdays, from 10am to 10pm; Sundays e holidays, from 2pm to 8pm. Address: Av. Magalhães de Castro, 12000 – Morumbi – West Side – São Paulo. Phone: (+55 11) 3552 3560. Address: Av. Brig. Faria Lima, 2232 – Jardim Paulistano – West Side – São Paulo. Address: Av. Presidente Juscelino Kubitschek, 2041 – Vila Olímpia – South Side – São Paulo. Phone: (+55 11) 3152 6800. Working Hours: Mondays to Saturdays, from 10am to 10pm; Sundays, from 2pm to 8pm. Phone: (+55 11) 3552 3033. Working Hours: Mondays to Fridays, from 10am30 to 10pm; Saturdays, from 10am to 10pm; Sundays, from 2pm to 8pm. Phone: (+55 11) 3152 6601. Working Hours: Mondays to Saturdays, from 9am to 8pm (Sundays are optional). Address: Rua Oscar Freire, s/nº – Jardins – West Side – São Paulo. Working Hours: Mondays to Fridays, from 9am to 8pm (Saturdays and Sundays are optional). Address: Av. Europa, s/nº – Jardins – West Side – São Paulo. Working Hours: Mondays to Fridays, from 9:30am to 7pm; Saturdays, from 9:30am to 2pm. Address: Avenida Europa, 110 – Jardins – West Side – São Paulo. Phone: (+55 11) 3061 3300. Working Hours: Mondays to Saturdays, from 10am to 8pm; Sundays, from 12pm to 18h. Address: Rua Oscar Freire, 1116 – Jardins – West Side – São Paulo. Phone: (+55 11) 3079 3415. Working Hours: Mondays to Fridays, from 10am to 7pm, and Saturdays, from 10am to 5pm. Phone: (+55 11) 3083 3612. Working Hours: Mondays to Fridays, from 10am to 8pm; Saturdays, from 10am to 7pm, Sundays, from 12pm to 18h. Phone: (+55 11) 3898 0229. Phone: (+55 11) 3088 0559. Phone: (+55 11) 3552 5200. Phone: (+55 11) 3815 7000. Working Hours: Mondays to Thursdays, from 12pm à 12:30am, Fridays, Saturdays and holidays from 12pm to 1am and Sundays from 12pm to 12am. Phone: (+55 11) 3087 1399. Working Hours: Mondays to Thursdays, from 7pm to 12:30am, Fridays to Saturdays, from 7pm to 1am. Local: lobby at Hotel Fasano. Phone: (+55 11) 3896 4000. Working Hours: Mondays to Thursdays, from 12pm to 12am, Fridays and Saturdays, from 12pm to 1am and Sundays from 12pm to 11pm. Phone: (+55 11) 2189 2929. Working Hours: Mondays to Saturdays, from 8am to 8:45pm. Phone: (+55 11) 3897 5000. Working Hours: Mondays to Saturdays, from 8am to 10pm, Sundays and holidays from 8am to 9pm. Phone: (+55 11) 3706 5211. As you walk on by Rua Oscar Freire it is possible to see several international brands stores. Photo: Caio Pimenta/SPTuris. On the city’s thematic streets, there are lots of variety and supplies. The biggest advantage is that it costs less and salespeople understand what you want. There are dozens of specialized market streets, with several stores, which side by side, offer over 50 kinds of products. You can assemble a super computer on Rua Santa Ifigênia, acquire the craziest tools at Florêncio de Abreu or equip a first class kitchen on Rua Paula Souza. Military or housemaid uniforms? Avenida Tiradentes. Hats, berets, head wear? Rua do Seminário. You’re going to get married or the bridesmaid dress? Rua São Caetano. For that and much more. Check it out! Rua 25 de março. Photo: Caio Pimenta/ SPTuris. Oscar Freire. Photo: Caio Pimenta/ SPTuris. São Paulo, economic center of Latin America, is a wide shopping area. The main international and national best brands stores are spread out in the Shopping Malls of the city. However, those who think that the Shopping Malls are simply places for buying things are wrong: the gastronomy, the cinemas and theaters make them large culture and leisure centers. The gathering of international best brand luxury stores is the main focus of Shopping Malls Cidade Jardim, JK and Iguatemi. Besides brands like Armani, Chanel, and Tiffany & Co., each center has special stores: Cidade Jardim hosts the only Lego store in SP, while Iguatemi has unique boutiques from stylist Diane Von Furstenberg and shoe designer Christian Louboutin. Now at Shopping Mall JK Iguatemi, a new luxury place in the city, there are TopShop and Miu Miu, which are already consolidated all over the globe. Opened in 1976, Shopping Mall Ibirapuera is one of the oldest in the city. Besides the stores, it offers a great gastronomic variety; with fast food options that range from good restaurants affiliated to exclusive ones like Mr. Fruit’s, an special fresh fruits market. With wooden tables and benches surrounded by over 140 kinds of plants, the outdoor’s boulevard from Shopping Mall Pateo Higienópolis is the perfect place to rest and enjoy coffee or tea after a shopping day. Indoors, the same floor has a food square, six cinema rooms and Teatro Folha. Located in one of the most traditional neighborhoods of the city, o Mooca Plaza Shopping Mall offers a selection of stores for all audiences. The place also offers a beauty salon and pet shop, which allows visitors to walk around with their pets freely. Shopping Mall Pateo Higienópolis. Photo: divulgação. The only establishment of this kind located downtown, Shopping Mall Light occupies, since 2007, the building Alexandre Mackenzie – inaugurated in 1929 and currently proclaimed as a historical landmark. It has 134 stores and it also holds expositions, exhibitions, dancing lessons, live music and theatrical plays. Every Sunday, for instance, from 2pm to 3pm, there is a free children’s play. Now, from Thursdays to Sundays there is a handcraft fair that gathers different techniques and products. Located on the West side of town, Bourbon Shopping Mall has department stores, sports articles and electronics, and a supermarket. The highlight is its cultural offer: it has 10 cinema rooms, a theater for 1400 people and a large affiliated store from Livraria Cultura. Morumbi Shopping Mall customers enjoy lots of technology. A conceptual store of electronic products offers futuristic appliances for demonstration; and another, an outdoors sports articles store, has a zero degrees Celsius simulator. 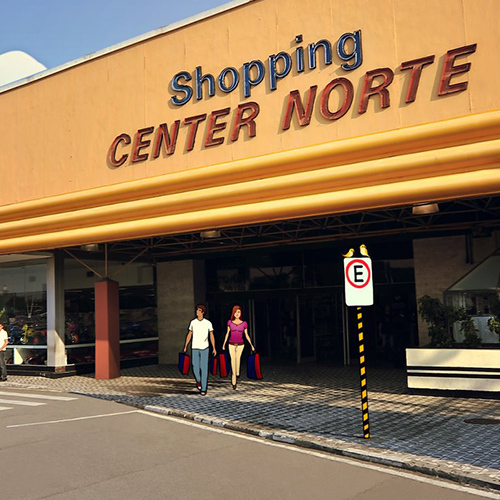 Established in 1984, Shopping Mall Center Norte is the most famous one of the region. The traditional center gathers stores from all kinds, like electronics, appliances, sports wear, kid’s fashion and jeans. Besides everything that it can offer, Santana Parque Shopping Mall has ecologically right features, like the use of natural lights from skylights, taps that avoid water waste, composting centers and oil recycling, and a water treatment for reuse. Shopping Mall D, founded in October 1994, has easy access through Marginal Tietê and it offers over 200 stores, with the most solid brands from national retail. With a flow of over 1 million of visitors per month, it is known for quality and a large variety in several sectors, among them are: fashion, furniture and decoration, technology and gastronomy (there are 2 food courts, 18 options of fast food and 3 restaurants). Hall at Shopping Mall Center Norte. Photo: divulgação. There are some Shopping Malls linked with subway stations. Inaugurated in 1997, Shopping Mall Metrô Tatuapé is the oldest of these kind and it is connected to Tatuapé station of the Red Line of the subway. Just as its neighbor Shopping Mall Boulevard Tatuapé surprises everyone with its diversity in stores, cinema and other gastronomic options. Still on the subway’s red line, Shopping Mall Metrô Itaquera has 200 stores in an area of 43 thousand m², food court, cinema and a parking lot with over 2 thousand spaces. Now on the blue line, visitors have Shopping Mall Metrô Santa Cruz, founded in 2001, and Shopping Mall Metrô Tucuruvi, inaugurated in 2013. Both have large food courts, several stores and 3D cinema rooms. Considered to be the city’s heart, the region of Avenida Paulista has different styles of Shopping Malls. The most sumptuous of them is Pátio Paulista: in its front there is a clock of 5 meters in diameter, manufactured in Boston, United States, and inside the mall there are international brands stores, unique coffee shops and employees that speak English. Shopping Mall Center 3 is the one with the easiest access, once it’s located right in the middle of Avenida Paulista. Its gastronomic offer is composed of several fast food networks and exclusive restaurants, with their own areas, besides candy stores and cafes. Next to the hype in the Baixo Augusta region, Shopping Mall Frei Caneca relies heavily on culture, hosting theaters Frei Caneca and Nair Belo, the Escola de Atores from director Wolf Maya and nine cinema rooms. Address: Rua Turiassú, 2100 – Perdizes – West Side – São Paulo. Phone: (+55 11) 3874 5050. Address: Av. Dr. Francisco Mesquita, 1000 – Vila Prudente – East Side – São Paulo. Working Hours: Mondays to Saturdays, das 10am to 10pm; Sundays and holidays, das 2pm to 8pm. Phone: (+55 11) 2066 4422. Address: Av. Leão Machado, 100 – Jaguaré – West Side – São Paulo. Working Hours: from Mondays to Saturdays, from 10am to 10pm; Sundays and holidays, 2pm to 8pm. Phone: (+55 11) 4040 4981. Address: Rua Xavantes, 719 – Brás – Downtown – São Paulo. Working Hours: Mondays to Fridays, from 8am to 6pm; Saturdays, from 8:30am to 1pm. Phone: (+55 11) 2081 9000. Address: Av. Roque Petroni Jr., 1089 – Brooklin Novo – West Side – São Paulo. Working Hours: Mondays to Saturdays, from 10 to 10pm; Sundays, from 2pm to 8pm. Phone: (+55 11) 4003 4132. Address: Rodovia Raposo Tavares – km 14,5 – Granja Viana – West Side – São Paulo. Working Hours: Mondays to Saturdays, 10am to 10pm; Sundays and holidays, 2pm to 8pm. Phone: (+55 11) 3732 5002. Address: Rua Conselheiro Moreira de Barros, 2780 – Santana – North Side – São Paulo. Working Hours: Mondays to Saturdays, from 10am to 10pm; Sundays from 2pm to 8pm. Phone: (+55 11) 2238 3002. Address: Estrada do Campo Limpo, 459 – Campo Limpo – South Side – São Paulo. Working Hours: Mondays to Saturdays, from 10am to 10pm; Sundays, from 12pm to 8pm. Phone: (+55 11) 4003 7320. Address: Av. Paulista, 2064 − Cerqueira César − Downtown − São Paulo. Working Hours: from Mondays to Saturdays, from 10am to 10pm; Sundays, from 10am to 8pm. Phone: (+55 11) 3285 2458. Address: Av. Professor Francisco Morato, 2718 – Butantã – West Side – São Paulo. Working Hours: from Mondays to Saturdays, das 10am to 10pm; Sundays and holidays, das 10am to 8pm. Phone: (+55 11) 3723 3900. Address: Av. Rebouças, 3970 – Pinheiros – West Side – São Paulo. Working Hours: from Mondays to Saturdays, das 10am to 10pm; Sundays and holidays, das 2pm to 8pm. Phone: (+55 11) 2197 7810. Address: Av. Ibirapuera, 3103 – Moema – South Side – São Paulo. Working Hours: Mondays to Saturdays, from 10am to 10pm; Sundays and holidays, from 2pm to 8pm. Phone: (+55 11) 5095 2300. Phone: (+55 11) 3816 6116. Address: Rua Catão, 72 – Vila Romana – West Side – São Paulo. Working Hours: from Mondays to Saturdays, das 10am to 10pm; Sundayss, das 12h to 18h. Phone: (+55 11) 3675 2011. Address: Rua Coronel Xavier de Toledo, 23 – Downtown – São Paulo. Working Hours: from Mondays to Fridays, 9am to 10pm; Saturdays, from 9am to 8pm; Sundays e holidays, das 11h to 18h. Phone: (+55 11) 3154 2299. Address: Travessa Casalbuono, 120 – Vila Guilherme – North Side – São Paulo. Working Hours: from Mondays to Saturdays, das 10am to 10pm. Sundays and holidays, 2pm to 8pm. Phone: (+55 11) 2224 5900. Address: Av. Cruzeiro do Sul, 1100 – Canindé – North Side – São Paulo. Working Hours: from Mondays to Saturdays, das 10am to 10pm; Sundays and holidays, 2pm to 8pm. Phone: (+55 11) 4506 6000. Address: Rua Frei Caneca, 569 – Consolação – Downtown – São Paulo. Phone: (+55 11) 3472 2075. Address: Av. Interlagos, 2255 – Jardim Umuarama – South Side – São Paulo. Phone: (+55 11) 3471 8888. Address: Av. Aricanduva, 5555 – Vila Matilde – East Side – São Paulo. Working Hours: from Mondays to Saturdays, das 10am to 10pm; Sundays and holidays, 12pm to 8pm. Phone: (+55 11) 3444 2000. Address: Av. Dr. Chucri Zaidan, 902 – Vila Cordeiro – West Side – São Paulo. Phone: (+55 11) 3048 7000. Address: Rua Gonçalves Crespo (esquina com a rua Tuiuti) – Tatuapé – East Side – São Paulo. Phone: (+55 11) 2225 7000. Address: Av. José Pinheiro Borges, s/nº − Itaquera – East Side – São Paulo. Phone: (+55 11) 2040 3635. Address: Av. Radial Leste (esquina com a Rua Tuiuti) – Tatuapé – East Side – São Paulo. Phone: (+55 11) 2090 7400. Address: Av. das Nações Unidas, 12901 – Brooklin Novo – West Side – São Paulo. Working Hours: from Mondays to Fridays, from 8am to 8pm. There is no service on weekends and holidays. Phone: (+55 11) 2928 8100. Address: Av. Higienópolis, 618 – Higienópolis – West Side – São Paulo. Phone: (+55 11) 3823 2300. Address: Rua Treze de Maio, 1947 – Bela Vista – Downtown – São Paulo. Phone: (+55 11) 3191 1100. Address: Rua Dr. João Ribeiro, 304 – Penha – East Side – São Paulo. Working Hours: from Mondays to Saturdays, das 10am to 10pm; Sundays and holidays, 12pm to 10pm. Phone: (+55 11) 4003 7210. Address: Ladeira Porto Geral, 14 – Downtown – São Paulo. Working Hours: from Mondays to Fridays, from 7am to 6:30pm; Saturdays, from 7am to 3pm; does not open on Sundays. Phone: (+55 11) 3101 1162. Address: Av. das Nações Unidas, 22540 – Interlagos – South Side – São Paulo. Phone: (+55 11) 5682 3666. Address: Rua Olimpíadas, 360 – Vila Olímpia – South Side – São Paulo. Phone: (+55 11) 4003 4173. Address: Av. das Nações Unidas, 4777 – Alto de Pinheiros – West Side – São Paulo. Phone: (+55 11) 3024 3738. Address: Avenida Francisco Matarazzo, s/nº – Água Branca – West Side – São Paulo. Tel: (+55 11) 3677 4000. Address: R. Capitão Pacheco e Chaves, 313 – Mooca – East Side – São Paulo. Address: Rua Domingos de Morais, 2564 – Vila Mariana – South Side – São Paulo (Integrated with subway station Santa Cruz). The popular market in São Paulo has retail stores of clothing, gifts, fabrics, imported goods, among others, that attract thousands of people in search of product variety and new things at low prices, for both personal use or resale. A great advantage of shopping downtown is the large options in public transportation available. One of the most popular regions in São Paulo is Rua 25 de Março and its area, at downtown, where you can find it all – from trinkets to silverware, from costume stores to home decoration articles and also electronics. It all comes with a price well below average. Daily, there are around 400 thousand people at the place in weekdays. In times next to festivities or holidays, like Christmas, this number can climb to over 1.2 million people. An imported products and general things paradise, it is the right place for more affordable shopping. Near there, Bom Retiro is a neighborhood that is strong in the clothing market. Rua José Paulino and its surroundings focus on tailoring and women clothing stores, also for parties. In its showcases it is possible to find new trends of the fashion world at affordable and inviting prices. On Brás, the streets Maria Marcolina and Oriente sell all kinds of clothing, and also bed sets and fabrics. On the same region, Feirinha da Madrugada attracts merchants and shoppers from all over the country, with over 2500 boxes of clothing, toys and accessories for cheap prices. For those who want to escape the big crowds and have a little comfort, shopping at popular malls is a good option. Different from street markets, they have ATMs, bathrooms, indoors environment, escalators, restaurants, coffee shops and cafeterias. And for those who come a long way, All Brás and Total Brás have even bus parking spaces, dorms and resting rooms for guides and drivers. Working Hours: Mondays to Fridays, from 2am to 4pm. Saturdays, from 2am to 2pm. Working Hours: Mondays to Fridays, from 5am to 4pm. Saturdays, from 5am to 2pm.